I call them the girlfriend shoes. You know, the ones you can wear only with a sympathetic girlfriend, for no man would wait for you to walk daintily in them. 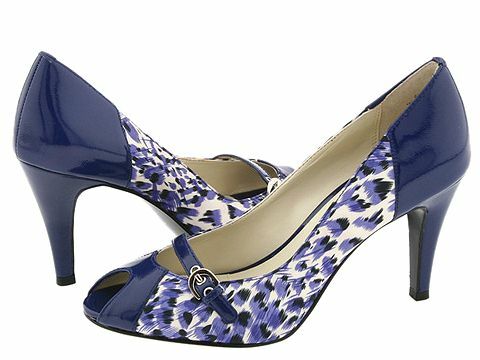 I scored this pair in blue at Macy’s, though I can assure you they’re long gone from the store now. My God, they’re stunning on your foot. As for comfort, one complaint – there’s a seam on the inside right over my little toe, just on one shoe, that kills me. I wear bandages on my toes to make it even remotely possible to walk in them. If it weren’t for that badly-placed seam, we’d be good to go. They do have a 4-inch heel, but it’s quite possible if you’re not running marathons. I did wear them to the city once and I was fine until that seam started to cripple me. Why? Why can’t we have gorgeous shoes and the understanding of the manufacturers on where those seams are going? March 10, 2008. shoes. Leave a comment.